Well you may remember Cheif Parrish from last week with the retained abdominal fluid. The strangest thing was that Cheif's presenting problem was that he had had a "seizure" and had then "run off" only to be found a couple of days later semi-comatose and infested with ticks and fly larva. He was in tough shape when he come in. His original lab work indicated that he was in renal failure. He had abdominal pain and was VERY dehydrated. After rehydration it was obvious that there was an abdominal fluid accumulation. We were not sure where this fluid was coming from. Analysis of the fluid indicated a low specific gravity, protein, glucose and relatively few cells. Our impression was that this probably represented urine accumlation in the abdoman. We needed to determine where the urine may have been leaking from. 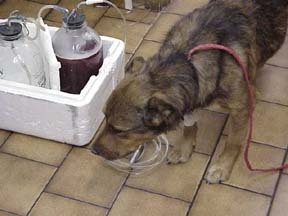 We injected Cheif with a dye that shows up white on radiographs and is excreted in the urine. The dye outlines the kidneys, ureters, bladder and urethra if everything is intact and functioning well. The Kidneys and ureters looked OK. However, as the urine filled the bladder there was obvious leakage from the bladder. We could not explain how a hole occured in the bladder. We were concerned about whether ther might be a tumor of the bladder or prostate that may have created a weakness in the bladder or urethra wall. No cells of this type were seen in the fluid of the abdoman but many times they are not visible. 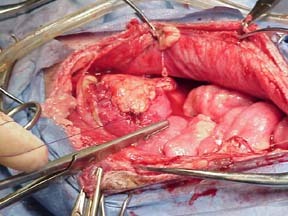 Fluid that accumulated in the abdoman was drained with needles and suction but this was a time consuming and potentially cantaminating proceedure. I'm sure that it was uncomfortable for Cheif but he never complained and it allowed us to get through the weekend for surgery on monday. 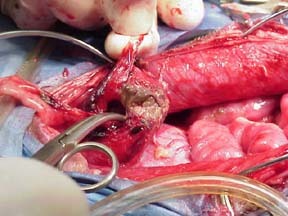 At surgery all we found during our exploratory was a very big hole in the bladder. 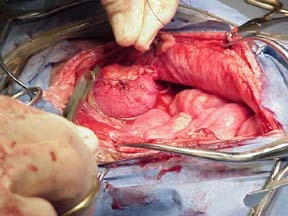 There was some necrotic tissue like might occur if some vascular event had comprimised the blood flow to a portion of the bladder. No indication of the presence of a tumor was seen. No stones were seen. No evidence of infection was detected. The necrotic tissue (brown tissue in this picture) was debrided. The forceps are inserted into the hole in the bladder. 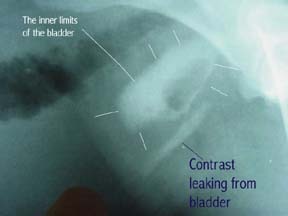 The bladder is shown here with a 3 layer closure that is commonly used on the bladder. The health of the tissue we were suturing looked pretty good. For addiditional security we added a flap of abdominal fat was sutured over the closure of the abdoman to provide an additional "serosal surface" for the closure. Following surgery a plastic catheter was sutured in place in the bladder to allow measured and continuous drainage of the bladder for 24 hours. Since Cheif seemed happy to urinate around the narrow tube we removed it that night. The next morning Cheif we eating and drinking more normally. We sent Cheif home on Wednesday and will recheck his kidney function about 5 days from now. However, he SEEMS to be doing awfully well. I have no idea how this happened in the first place. We saw cheif on 7-19 and repeated lab work. The kidney function tests were normal and we assume that things are on the mend. I am fairly amazed at the outcome of this case since it looked to me like one of those cases that would do poorly then get worse! Sometimes you get lucky!